You can count on a good meal if you celebrate today’s food holiday. October 17 is National Four Prunes Day! (As it turns out, we ended up celebrating both food holidays today. Tara and I met up for lunch at The Old Spaghetti Factory. She got ravioli, I ordered spaghetti with Italian sausage. 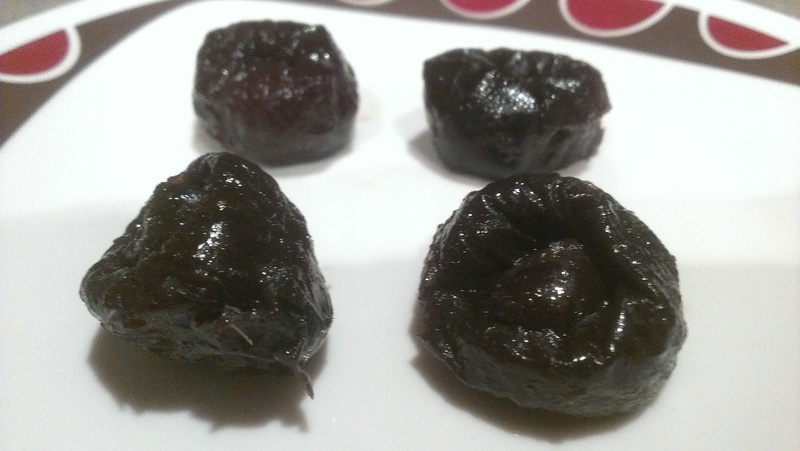 But the focus of the blog today is on prunes). Actually, further research shows the reason for four prunes. As this blog post (and other scientific articles) states, doctors recommend eating four prunes a day to slow the aging process of the body and brain. Ahh. I’m all about living longer, so bring on the prunes! Prunes get a bad rap due to their high fiber content. In other words, they make you poop! Because of this, they have been rebranded “dried plums” in recent years, which makes sense seeing that they are dried plums. But I think this is silly. There’s nothing wrong with the name prune, and if it’s associated with constipation relief, so be it. They are considered nutritional superstars, and are high in antioxidants, vitamin A, potassium, and iron. Prunes are native to Western Asia, but eventually spread through Europe and the Balkan Islands. They were introduced to North America by Louis Pellier, a Frenchman whose mining operation during the Gold Rush of 1848 was a bust. After finding no gold in them thar hills, Pellier purchased a plot of farmland in the Santa Clara Valley and planted plum trees in 1856. The plum industry took off, and by the mid 1880s, Pellier and others were looking for ways to expand business. Dried plums were a hit in Europe and were being imported at the rate of 22,000 tons a year, so focus shifted to growing them here. And the rest is high fiber history. I love prunes. In school, my classmates would always give me their stewed prunes at lunch. I could never figure out why they’d pass on such a delicious and sweet part of the meal! I also enjoyed drinking prune juice because I liked the flavor. I guess I’m odd that way. The bottom line is, celebrating this holiday was a breeze. For me, anyway. I had my four prunes for breakfast. Tara was less enthused, but also took part. She liked them more than she thought she would. Not sure if I could eat stewed prunes but I have eaten prunes before and they are a bit different. One thing I remember most is the aftertaste and how your mouth felt like it was covered in something…I can’t come up with a word but it was just…WEIRD. I think I know what you’re talking about. They’re a little on the sticky side. My family has a recipe for Russian cookies we make every Christmas – they are filled with prune or apricot and sprinkled with powdered sugar. Delicious! 4 bites, lol. You know her well! But I edited the post, because we ended up celebrating National Pasta Day too, even though we weren’t originally planning on it.